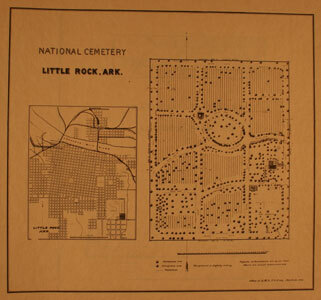 Little Rock National Cemetery in Little Rock, Arkansas, opened in 1866, when the Federal Government purchased land from the city cemetery to relocate the remains of Union soldiers from across the state to a more central location. Many of the first burials were reinterments from Pine Bluff, DeVall’s Bluff, Lewisburg, Princeton, and Marks' Mill, among others. Two years later, in 1868, the site was officially established as a national cemetery. Later, an adjacent Confederate cemetery was incorporated into the national cemetery. The fall of Vicksburg, Mississippi in July 1863 left the Confederacy with a tenuous hold on its western states. Confederate Major General Sterling Price, charged with the defense of Little Rock, first encountered Union forces that summer at Brownsville, 25 miles northwest of the capital, before falling back to Reed’s Bridge, near Jacksonville. The Union’s superior artillery forced Price to retreat once more. He made a final stand at Fourche Bayou, five miles southwest of Little Rock, but was defeated. The Confederates had just enough time to evacuate most of their supplies from the city, though the Little Rock Arsenal and its large stocks of powder and ammunition fell into Union hands. The 40-day campaign cost the Union 137 casualties (18 killed, 188 wounded, and 1 missing), as well as 64 casualties for the Confederacy. The eastern half of the national cemetery contains the oldest sections, including an area at the southeast corner of the property reserved for burials of troops from the garrison at the post. The original layout of the grounds was rectangular in plan with 12 irregular sections. A Confederate cemetery, established adjacent to the national cemetery, opened in 1884 to accept the reinterments of 640 Confederate veterans from Little Rock’s Mount Holly Cemetery. The national cemetery and Confederate cemetery operated separately until 1913, when the Secretary of War accepted ownership of the Confederate cemetery. At the southwest corner of the property is the cemetery’s main entrance, marked by a double iron gate with pedestrian gates on either side. While large sections of the original, three-foot high fieldstone wall exist around Sections 1-12, more modern fencing, including wrought iron and chain link, now enclose the newer sections to the north, south, and west. The first superintendent’s lodge, a three-room brick building constructed in 1869, was replaced in 1908 by a two-story, six-room building. A sunroom and sleeping porch were added in the 1930s, but the lodge was demolished in 1995 to make way for the current administration building. A cast-stone committal shelter, built in 1996, sits just north of the main entrance. A brick rostrum, erected by the Memorial Chapter of the United Daughters of the Confederacy around 1907 in what was the former Confederate cemetery, was originally used for Confederate Memorial Day ceremonies. 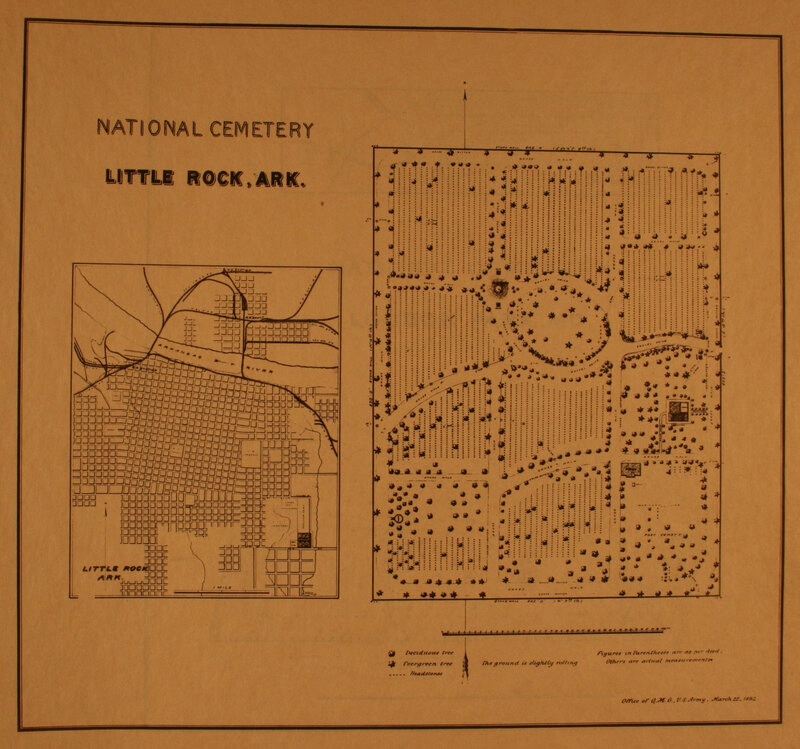 1893 Site Plan of Little Rock National Cemetery. Two major monuments are located in the cemetery, and each is individually listed in the National Register of Historic Places. The Confederate Monument, erected in 1884 by the Trustees of Mount Holly Cemetery, is composed of a squat marble obelisk set atop a two-part base. It is located in the Confederate section near the rostrum. Also at the cemetery is the Minnesota Monument, dedicated to the Union volunteers from Minnesota who perished in the South. Designed by St. Paul sculptor John K. Daniels and erected by the Minnesota Monument Commission in 1916, the memorial honors 36 Minnesota soldiers buried at Little Rock National Cemetery. The 16-foot tall bronze sculpture depicts a Union soldier, head bowed, with his cap held against his heart and his hand resting atop his rifle, barrel pointing downward. Identical statues are located in Memphis National Cemetery and Andersonville National Cemetery. Minnesota monuments at Nashville National Cemetery and Jefferson Barracks National Cemetery, both designed by Daniels, feature a female figure holding a wreath. Regimental Minnesota monuments were erected at Shiloh National Cemetery and Vicksburg National Cemetery. 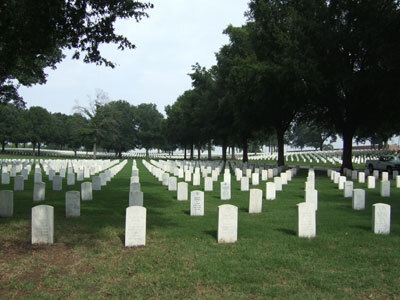 Little Rock National Cemetery is located at 2523 Confederate Blvd., in Little Rock, AR. The cemetery is open for visitation daily from dawn to dusk; the administrative office is open Monday-Friday from 8:00am to 4:30pm, and is closed on all Federal holidays except for Memorial Day. For more information, please contact the cemetery office at 501-324-6401, or visit the Department of Veterans Affairs website. While visiting, please be mindful that our national cemeteries are hallowed ground. Be respectful to all of our nation’s fallen soldiers and their families. Additional cemetery policies may be posted on site. Little Rock National Cemetery was photographed to the standards established by the National Park Service’s Historic American Landscapes Survey.